That question that we came alongside was influenced by the people who sponsored the project. We’re doing a lot of work at the moment with the University of Cambridge because they are developing the northern edge of Cambridge into a new suburb. It’s called Eddington. They commissioned us to create an education programme to run alongside the public art that was being commissioned. It’s a big investment. It’s very high spec area. There’s a lot of very prestigious architects working on it, but they came to the idea that actually the public art could have an education programme alongside it. You talked about how one of the drivers that got you started was a sense of a decline in the creative opportunities for young people. I wonder how you would evaluate the state of health or the degree of attention that we give to imagination in the UK in 2018? How would you assess and evaluate that? I mean, what gets counted, gets measured? What’s that expression? There’s something like that. I’m not saying that I want to pursue this goal of being able to measure it, but if it were easier – if we had a way of valuing it – we’d probably bring it back in to being more clearly valued than we do. It’s very, very difficult. The whole drift of what you see going on in education is to value and measure what’s easily measurable. Hence we’ve got this mad assessment and accountability system that has squeezed out any space for imagination. But I don’t think it’s dead. I don’t think it’s gone. What’s incredible is that when you come back in and push a chink in, it’s all there, flourishing away in people’s heads. We are story tellers and we are imaginators. It’s all going on, but we’re not listening to it. Once we start listening again we find it in absolute brilliant quantities, but we’re just not listening to it. The state of imagination is fine if we’re listening. I’m aware of that as parent. You’re on track and you want to get somewhere and you don’t want to stop or look or listen or slow down or go off on a tangent necessarily. And the tangential side of it is difficult to accommodate. It’s about pushing the chinks back in to find spaces for it. I’m part of the All-Parliamentary Group on Art, Craft and Design in Education and at the meeting last week there were some absolutely amazing Year 8s, so they were 12, 13 year olds, who were being offered a brilliant out of school – that’s what’s sad, it wasn’t within the school, it was out of school – they were calling themselves ‘creative producers’ and they were creating their own animations that were about talking to each other about how they can still be creative. One of the questions was, “What sort of creative opportunities do you get in primary school?” One of the girls said, “in Year 5 we had one music lesson, and one art lesson in the whole year.” It’s jaw droppingly shocking. But she was exploding with ideas and agency. It’s all there if you facilitate it in the right way. Why does that matter? What is the risk of a generation of kids growing up through an education system that doesn’t offer them that kind of space? What problems are we creating by nudging that out of the picture? If nobody is interested in your ideas, you’re just a widget in a system being poured stuff in that somebody else has decided is important for you, aren’t you? You’re just being told to swallow stuff that you don’t know whether you care about it or not. I think about masses of my education, and I was a very good swallower. I was a very good swallower and regurgitator, but I can’t remember it all. But the stuff that’s stuck is the stuff that I was given a bit of space to have my own thoughts and ideas on. If you go down the more political route, you might think, “we don’t want people to be independent thinkers. We want them to be servers; put where we put them and get on with doing with what we want them to do.” But your question at the beginning about where’s the failure of imagination around climate change – well, that’s where we’re going to end up if we don’t start inviting people to have some sense of idea. I suppose when I try and give a sense of why I think the work is important, I’ve been referencing some of the stuff that’s coming out of the Cultural Learning Alliance work that they’ve been doing about trying to show the long-term impact on having access to a broad and rich cultural life. That’s evidence around young people who’ve had those opportunities to go on to vote. They go on to volunteer. They go on to be the kind of citizens we need around us. Actually the implications are therefore if they don’t have that, we get the kind of passive, lethargic, switched off, angry citizens that aren’t going to help us get out of this hole, are they? If we had an education system in this country from which young people emerged as imaginative as they could possibly be – if that was the goal of our education system – what would it look like? Can you describe what that education would have looked like? What would it have included? Much more self-directed learning opportunities. Much more opportunity for individuals to find what interests them and build and pursue an interest around that. Whether it be building a boat, or opening up a rabbit … One of my colleagues introduced me to the work of Susan Isaacs who ran a school in Cambridge in the 1930s. They had a working carpentry space. They had a working laboratory space. They had a building space. Absolutely hands on experiential project-based learning opportunities which the children could navigate their way through and self-direct. The sort of sense of discovery and motivation that you see in that is extraordinary. I can’t imagine how you do it with the numbers that we’ve got, but I think there are some really interesting models. We’ve been very influenced as a group. Many of the artists I’ve worked with have been able to go out to Reggio Emilia in northern Italy. It’s a very incredible story in that the families and the citizens got together after the war and thought about what sort of education system did they want for their children in response to what they’d seen happen in Italy during the war. They created an approach to education which places the arts, and that way of exploring your ideas through an aesthetic response with materials, and much more experiential learning, right in the heart of all the early years centres that are in this area of northern Italy. World famous people travel all over to visit there. They have an arts studio, an ‘atelier’, in the middle of their yearly years centres. The school functions around an atelier space. Like a laboratory space. That work is facilitated by what they call an ‘atelierista’, so she or he is a creative pedagogue who enables that learning through this hands-on laboratory approach. It’s very striking. The work that comes out of Reggio is extraordinary. One of the first things that we did as a group here in Cambridge was support bringing an exhibition called ‘The 100 Languages of Children’. They talk about children having a hundred languages. They talk about children expressing their ideas in a hundred different ways. It’s a poem that illustrates that idea. That stimulated us to think about this idea of a creative practice that we could be sharing with other people. I’m not saying we’ve solved it at all. We’re struggling away thinking how to do it all the time, but we do I suppose have an approach and are aware of a way of thinking and exploring with children that does open up a space for their ideas. That then led us to think about how we could share that with others. We have this approach with professional development that we call ‘Creativity as Practice’. 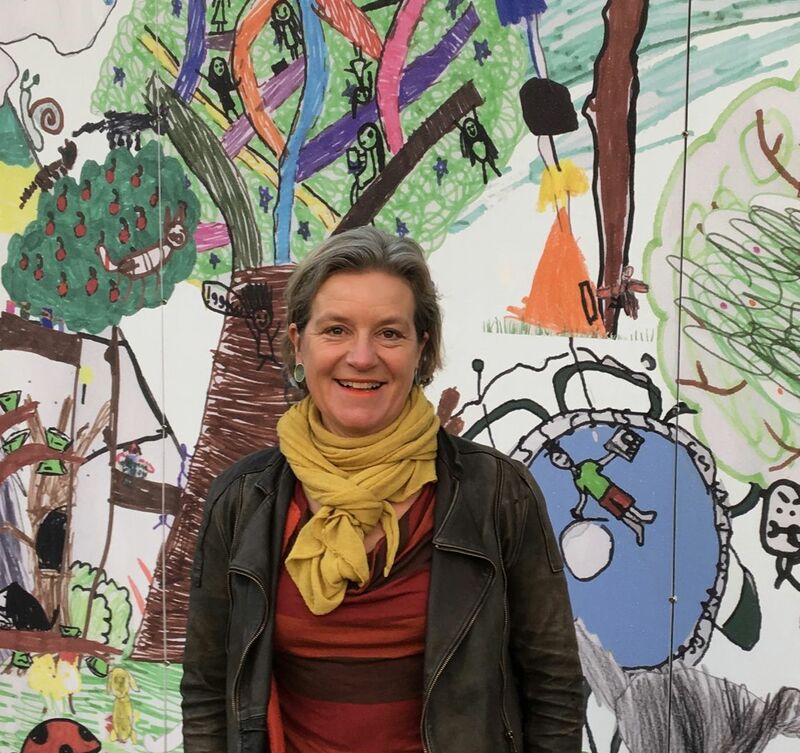 In a paper about your Artscapers project, Dr Esther Sayers wrote “I argue that art in education projects are not means to create likeminded citizens, but rather a means to give people a voice by encountering what is strange, different, and other and using that to imagine an alternative future.” Could you expand on that a little bit? I thought that was really beautiful. That’s coming back to that idea that it’s about acknowledging the individuality in the system, and saying that there’s an opportunity there for people to have their own ideas, but still in a collaborative way. What we’re always trying to do is build bridges between people and their ideas, and find ways for people to work together on their ideas, but not ignore the fact that there’s an individual there as well. You need that collaborative opportunity. I think that’s what we find has got so diminished in the schools that we’re working in, is that collaborative approach has just been lost because the curriculum is so dried out and so packed and so busy that they’re on this road map that doesn’t give them an opportunity to do that kind of collaborative working. That, I think, is where some of these issues around these mental health problems that we’re seeing are coming through, is that they’re being… They’re just not having the struggle and the joy of connecting with each other in enough ways. Can you tell us about your ‘Fantastical Maps’? We talk about the fantastical as a way of acknowledging that when you’re in the world, you’re both there in a real but also in an imaginary way. We are embodied imaginations. What we’re trying to do with the maps is make that visible. There’s both the real place around you but there’s also this extraordinary place that you carry in your stories and your imaginations and in your creative ideas and in the history that’s underneath you and the legends that may be about the place you’re in. We’ve been playing with that idea of a fantastical way into a space for years now. The maps came out of a desire to make that visible, because what we’re doing with the projects is very much embracing this idea of being on a journey together, and that the process is what’s important, and we’re discovering and exploring and finding things out together, but that maybe the maps are a way of drawing together those threads and offering this idea of a fantastical as a sort of jumping off place for more fantastical imaginings. Fantastical Map for Eynesbury Primary School ©Elena Arévalo Melville 2016. One of the people who came in as part of that work was the poet Jackie Kay. She came and she said, “I don’t know that I’ll write, Ruth. Don’t expect me to write when I’m with the children.” But she was curious because she had been researching her own family history and her father was a tree scientist. She was curious to come and spend time in the woods with the young children. But actually she found she couldn’t stop writing. And the children wrote prolifically with her, so we’ve been able to publish that. Anyway, from that came the first Fantastical Map. It’s been a great way to frame an invitation to a school about why you might work with us. Because it celebrates and draws together these layers that we discover through the process of working with the children, then with their families, then with the wider community. It’s an awesome thing then because we give it to this brilliant artist called Elena, Elena Arevalo Melville, and we give her all the work, and we talk about what we’ve discovered with the children and what we’ve found out about a place, but then she sits and she puts the work everywhere in her own house, and then she layers up – they’re digital, one of them has about 140 layers. A Fantastical Map for Roundhouse Primary School ©Elena Arévalo Melville 2017. We’ve talked about wouldn’t it be amazing to be able to animate the way those layers come together? Because actually of course you could re-layer it in all sorts of ways. It’s limitless. It’s limitless. But we want to invite people to think about when you’re somewhere, you could potentially be open to all these extraordinary things that are going on around you. Have adults ever done them? They’re done with kids but it’s a tool presumably that you could use with people of any age? Totally. Totally. It can be used to make visible all sorts of ways of thinking about a place. But using that approach. We love placing children as experts in the middle. We love their capacity to navigate for others a way into a place. Because they are play experts, and they are very unselfconscious about filtering. They don’t bring that baggage about judgement and anxiety that many, many of us bring to places. We’ve done quite a lot of work in Kettle’s Yard gallery here in Cambridge and in Wysing Arts Centre where we invited children to lead their families, as playful experts, as a way into the contemporary art that they might be visiting together. Which is notoriously a thing that can trigger a huge amount of anxiety and judgement or not understanding it. But actually if you come at it through a more playful open way of thinking about it, then you can find your own responses to that. A Fantastical Map for Offord Primary School ©Elena Arévalo Melville 2016. Why does it matter that kids connect the place around them? It feels like that work is such a beautiful way of really seeing the world closest to you in a much deeper kind of a way. Whereas in school we go to school, go home, we often have no sense of what’s going on around us in terms of the wild spaces and the natural spaces. Why is that connection so important? Because if you know the place that you’re a part of, you’re going to care about it. And if you care about it, you’re going to look after it, and then you’re going to notice. Rob Macfarlane talks about this a lot in the work that he’s been doing, but if we don’t know the places we’re in, then we’re not going to look after them. That’s self-evident in what’s going on around the world, isn’t it? That lack of care and that lack of noticing. Emotional connection is what’s going to enable us to start better looking after our world, and each other. What we’re aware of in the work is that we see children care for themselves better because they have a greater sense of agency and authority about their own ideas. But they care for each other and then that ripples out. It connects everything up in a better way. If you had been elected as the Prime Minister at the last election, and you had run on a platform of ‘Make Britain Imaginative again’, recognising that we needed a massive boost in our imaginative capacity – whether it be in work, or university, or in home life, or whatever – I wonder what you might do in your first 100 days in Number 10? I would start with education! I would start with putting space back into education for ideas, and that growing of ideas and imagination. We’ve got a model that I was just talking about with Reggio about having these creative lab spaces at the heart of education institutions. Education has to be open to everyone. We need that lifelong approach. It’s absolutely right. We could have an atelier space in our local libraries. I work a lot with our local library. I’m passionate about them as really important spaces for people to come in and share ideas that aren’t connected to any church or faith. They’re just there in the heart of communities. You could have lab spaces in libraries so that everybody could access them to facilitate a way of thinking that just allows people to explore and bring their own ideas and their own thoughts, and work together with other people. So I would probably invest in an atelier space for every community. If people are reading this and they have kids or they’re a teacher with kids and they’re thinking, “I’m inspired. I’m going to take these kids out. We’re going to go out into the woods…” Would you have any tips for them? Any suggestions for how to really connect those kids to that place? Yes. Placing your child as the leader of that experience. We talk about ‘slowliness’, which I’ve used so much now I’ve forgotten it’s not a word. But it’s a beautiful word, and it really encapsulates that idea that actually, if you slow down, that brings in space in all sorts of metaphorical and real ways to give you a chance to notice. I would invite people with their own children to ask the children to think about where an adventure could be had. And to go slowly. To embrace this idea of slowliness with them. And don’t go with digital. Go simply. Take paper and pencil, but you don’t need… What we find continually with our work is that actually if you strip things away, the powerful imaginations that you have are more than enough. And the materials that are around you when you’re outdoors are more than enough. You don’t need to go with complicated equipment. You know, you need to be warm, and you need to be comfortable. But go slowly, and let children lead you. Wild exchange in Eynesbury (St Neots). You mentioned digital technologies. There’s a lot of research I’ve been doing about the impact that those things are having on attention spans and imagination and ability to concentrate. I think you’re right, it’s like if we go out into nature and we’re looking at everything through a little screen, somebody described it as prophylactic layers between us and what we’re trying to see. In terms of creating Fantastical Maps, or in terms of invoking curiosity and imagination, do those technologies have any role to play? Or is most of your work based around, “Put that to one side and we’re going to take you on a journey with something else.” Could you create that fantastical map if everybody had iPads wandering around in the woods? I mean, you could. I’m not at all saying it’s not valuable or useful, but the hands-on touching and feeling, the awakening of your senses, by getting rid of… I like that idea that it’s like a layer. It’s a bloody ridiculously skilful layer, because no sooner do you pick it up and you see you’ve got a WhatsApp and your Facebook messenger, you’re immediately distracted from what you’re trying to do. It absolutely has its place, but it comes at the end of a process, or as part of a process, but that hands-on touch and sensory work is paramount first. I was reading some work by the Clayground Collective, they were talking about work by Shirley Brice Heath at Stanford, who was reporting on work she had been doing with the medical profession in America, who were talking about the lack of diagnostic skills that they’re seeing coming through in young people because of their lack of experience with manipulating and using materials. So their ability to use their hands as part of the diagnostic work. She was talking about we have 20 times more receptors coming back from our fingers, through our touch, than is going out. They’re these incredible fact-finding things but if we’re using them on screens we’re just diminishing that opportunity to bring back that information into our brains all the time. I thought that was really striking. How do you see kids’ imaginations change as they grow up? If you’re working with kids from little going upwards? How does it change as they grow? Sadly it changes because layered on top of it comes, “I can’t. I can’t.” It becomes a message of, “I’m not, I shouldn’t, I can’t.” There’s a sort of anxiety around. You watch children mark-making freely who feel very powerful around their own expressive powers with drawing, and they are so free. And yet that so quickly is dried out and becomes something that they don’t do. A lot of your work it seems is about creating spaces in which kids can be imaginative. So often, in a way, coming from a school setting where that’s not their everyday experience, you’re having to create the space within which their imaginations can flourish. If you were to identify the ingredients for creating a space like that, what would be the elements of creating a space that you could hold in which people feel confident that they can let their imaginations run? There’s an attention to the actual physicality of it. That would be almost nothing in it. You would strip it out. What I find overwhelming about classrooms when I go into them is the noise that’s all over the walls, of phonics, and alphabets, and spelling and messages. The rules. Blah, blah, blah, blah, blah. You are bombarded. What we often do when we start is we literally physically cover things over. In a respectful way. And that’s why the outdoors is such an enabling space, because it’s not. We go to the outdoors. We go to as unkempt, if you like, a space as possible. Over the years, one of the sadnesses has been that some of the spaces that we’ve worked in and helped families come to and then built up a reputation as being a space to visit, and then actually what can happen is – through good intentions – to therefore make that space available for parties or family I don’t know, is it gets tidied up. You know, it’s almost people have hoovered the paths, and they put edges along. All the nettles get taken out. There’s a really careful attention to the physical qualities of the space, which is about making sure there is space for ideas. There’s that quality of time that’s really, really important; about slowing things down. We think really carefully about the provocations or the invitations, so that that’s about coming alongside the interests of the people we’re working with. That doesn’t have to be the children, but that’s about respectfully starting with a process of listening to what they’re interested in. Listening to what they’re noticing, and bringing in invitations and provocations that respond to those interests. We’ll talk about children leading. That doesn’t mean that we don’t do anything. That means that we’re trying to listen to what they are interested in and come alongside them with those interests. I’ve spoken to quite a few teachers, which has been quite interesting, about their experience of being within mainstream education and trying to weave imagination into what they do, and it just sounds absolutely heartbreaking from a lot of the people that I’ve spoken to about how that is. How can we best support them, do you think, to weave imagination into what they do? Well on a policy level, we could strip out the assessment process. We could change the assessment criteria. There’s a tiny, tiny little chink just come in with the new Ofsted framework that was announced a couple of weeks ago. They’re replacing this idea of outcomes with words that talk about the quality of the education, the behaviour and the attributes of the student’s personal development. From what I understand from people who follow that, there’s a little bit of a chink in there. It’s going to take a long time for that message to come through. So I suppose we best support them by taking the pressure off them to measure everything they do with children, so that they have space. And we remind them that they are imaginative people themselves. I talk to colleagues who work in teacher training and the lack of space that’s given now in the teacher training process for them to think about their own development as imaginative people, they’re increasingly trained as technicians, and that’s not going to give you an opportunity to think about yourself and your imaginative capacities. There’s a big role in leadership about trust, about restoring that sense of trusting them to do that work, and giving them the space to build those relationships with their children. But I don’t feel very positive about it all. And no wonder that we’re seeing problems with teacher retention and teacher recruitment that we are. Because you go into it because you’re developing young people, but if actually all you’re doing is frankly bullying them along a kind of set of systems that they’re not very interested in, how utterly, utterly draining and depressing, and really, really upsetting.